The families of students injured in the Berkeley balcony collapse have expressed their thanks. 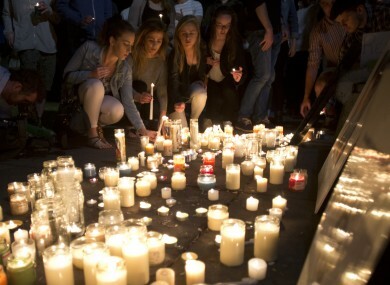 Mourners lay candles during a vigil in June. THE FAMILIES OF the Irish students injured in last month’s balcony collapse in California have released a statement thanking all those who have supported them during recent weeks. “We hope that our children will be able to make their way home in the coming weeks and months when they are individually ready and sufficiently strong enough to do so,” the families said, RTÉ News reports. The families also paid tribute to the six students who died in tragedy. “Our constant thoughts and prayers are with the bereaved families and friends of Eimear Walsh, Ashley Donohue, Olivia Burke, Niccolai Schuster, Lorcán Miller and Eoghan Culligan,” they continued. They called the J1 students’ friends who stayed on to support them as “genuine heroes”, praising them for responding “tenderly to the needs of our children at the scene and in the immediate horrific aftermath”. The families thanked organisations ranging from the Irish Consulate and Immigration Pastoral Centre in San Francisco, volunteers, alma mater, gardaí, to the hospitals currently providing specialist treatment for the injured students, and praised the fundraising efforts. We hope that our children will be able to make their way home in the coming weeks and months when they are individually ready and sufficiently strong enough to do so. They appealed for a continued respect for their privacy. Two fundraisers held over the weekend raised more than €25,000 for the treatment of the students. A fundraising gig in Dublin featuring the likes of Gavin James and Mundy raised just shy of its €10,000 target, while a tag rugby event for Aoife Beary raised more than €16,000. The tragedy has sparked the implementation of new building regulations in California, including inspections of all existing balconies to prevent another similar collapse. Email “Berkeley parents: J1 students are 'genuine heroes who responded tenderly to the needs of our children'”. Feedback on “Berkeley parents: J1 students are 'genuine heroes who responded tenderly to the needs of our children'”.